Born to a wealthy, noble family and raised Christian. Well-educated, he became a professional public speaker and apologist; his explanations of Christianity brought many converts. Soldier. Deacon. Duke of Thessaly under emperor Maximian in 190. When he was found to be a Christian he was arrested and imprisoned in a bath-house during the persecutions of Diocletian. Martyr. His story was extremely popular in the Middle Ages. Reported to have appeared during a battle in 586, centuries after his death, to help defend Thessalonika. Over 200 churches in the Balkans are known to have been dedicated to him. Known as a pious, intelligent youth. A Dominican, he was a monk at age 15, priest at 25. Pope Urban V appointed him inquisitor-general to fight heresies in Lombardy and Genoa, Italy in 1360; he was one of the youngest men to hold that office. A complex and difficult job, it was also a near death-sentence as it put him in constant conflict with heretics. His apostolate lasted 14 years. Preacher. Elected prior in Savigliano, Italy in 1368; he built their new abbey without criticism of its luxury, a charge heretics were always anxious to bring against Catholic builders. Great friend of the poor. Antony's preaching and his simple and unostentatious lifestyle so angered the heretics, who saw no character flaw they could use as a weapon, they decided that they must kill him. He was martyred on the Sunday after Easter; as he preached against heresy, seven heretics stabbed him. Orphaned at age five, Katarzyna was raised by childless relatives. Entered the Congregation of the Sisters Servants of Mary Immaculate in 1930, taking the name Celestyna and making pertual vows on 15 September 1938. Catechist and kindergarten teacher. During World War II she ran an orphanage, led a religious house, and continued to work as a catechist. Arrested by the Gestapo on 19 February 1942 at Brzozów, Poland, charged with conspiracy against the Nazi regime. Imprisoned in Jaslo, Poland, then Tarnów, Poland, and finally shipped to Auschwitz-Birkenau extermination camp where she was put to work digging ditches. Developed tuberculosis and typhoid, and her health finally collapsed completely. Martyr. Born to the Florentine nobility, his relics indicate that he was a pretty tall individual. After a mis-spent youth, he became involved in the political and martial conflicts between the Guelphs and the Ghibellines, the Pope and the emperor of Germany. Soldier. 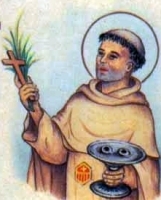 He became a spiritual student of Saint Philip Benizi c.1280, had a conversion, and became a Servite friar. Priest, ordained c.1283. Assistant to Saint Philip, and was at his death bed. Prior of the Servite convent of Todi, Italy in 1285. Miracle worker; once, having broken the water jug he was using to carry water, he used the cloth of his habit as a bowel to bring water back to the convent for his brothers. Late in life he returned to the Servite convent on Monte Senario to spent his last days in prayer and penance. Born to a noble family of Gaul. Priest. 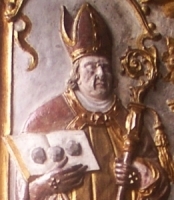 Bishop of Le Mans, France from 348. Friend of Saint Martin of Tours. Served his diocese for 45 years, building many churches. The translation of his relics from Le Mans to Paderborn, Germany led to a sister-city relation that has lasted for over 1,000 years. 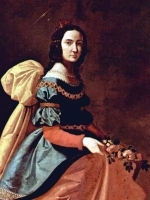 Daughter of Saint Bertille and Saint Walbert of Hainault. Sister of Saint Aldegundis. Married to Saint Vincent Madelgaire, count of Hainault, a lord in King Dagobert's court. Mother of two sons and two daughters - including Saint Landericus of Soignies, Saint Madalberta and Saint Aldetrudis. She convinced her husband to become a monk, and he is now known as Saint Vincent Madelgaire. Spiritual student of Saint Guislain. Took the veil from Saint Aubert. Founded a religious community in Mons, Belgium, but lived as a member, not a leader. Target of much slander from the secular world. Joined the Franciscans as a young man; he was noted by his brothers for his strict adherence to the Rule of the Order. Priest. Missionary in Armenia in 1289. Envoy from King Haython II of Armenia to the papal court. Missionary in Persia (modern Iran) in 1305. Missionary to Hindustan (part of modern India) in 1320, working with Blessed James of Padua, Blessed Peter of Siena, and Blessed Demetrius of Triflis. Martyr. Born to a large family. Nun. Member of the Daughters of Charity of Saint Vincent de Paul in 1986. Began working at a homeless center in El Salvador on 29 January 1991. Murdered by a man who became obsessed with her and angered that she would not give up her religious life for him. Martyr. Born a princess, the daughter of King Vortimer Fendigaid. Married to Prince Ynyr. Queen of Gwent. While on pilgrimage, she received a dream in which she was told to build a convent where she slept; the church there has survived to today. Mother of Saint Ceidio; she helped him evangelize the area around Minster in Cornwall. Widow. Hermit near Limousin, France, probably supporting himself as a wood cutter. 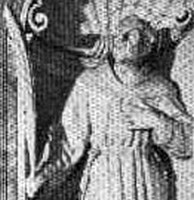 Founder and abbot of the Augustinian canons regular monastery of Saint John at Aureil, Limousin. Friend and benefactor of Saint Stephen of Muret. Benedictine monk at Fontenelle Abbey. Primicerius of Metz, France. Bishop of Rouen, France in 722. Bishop of Paris, France. Abbot at Fontenelle. Abbot at Jumieges. He used these positions, several of which he held at once, to inspire and support piety and learning in his diocese, and among his monks. He eventually resigned all his offices and retired to Jumieges as a choir monk. Bishop of Amida, Mesopotamia (modern Diyarbakir, Turkey). Noted for his work with, and charity to Persian prisoners of war. To pay their ransom, he melted down the altar pieces and sacred vessels of his church. This is impressed the Persian King Bahram V so much that he ended the persecution of Christians in his domain. Born to Moorish parents. Convert to Christianity. Anchorite near Briviesca, Burgos, Spain. Mercedarian friar. While sailing to north Africa on a mission for the Order to ransom Christians enslaved by Muslims, he was captured by Muslims, taken to Tunis, buried to the waist, and used for archery practice before finally being mutilated, blinded and murdered. Martyr. Fourth century patrician in Cappadocia. During the persecutions of Julian the Apostate, Eupsychius was arrested, convicted, tortured and executed for being a Christian and for having destroyed the temple of the pagan god of fortune in Caesarea. Martyr. Brother of Saint Apphian of Caesarea. Publicly reproved a judge who had forced nuns to work in brothels in order to break them of their faith during the persecutions of emperor Maximinus. For this, he was imprisoned, tortured and executed. Martyr. Priest in Alexandria, Egypt. When Saint Dionysius of Alexandria was exiled in 257, Maximus governed the patriarchate of Alexandria. Chosen bishop of Alexandria in 265. Studied at and supported the catechetical school in Alexandria. Franciscan. Missionary. Martyred with Blessed Thomas of Tolentino, Blessed Peter of Siena, and Blessed Demetrius of Triflis while en route to evangelize Ceylon and China. Religious sister in the Daughters of Charity of Saint Vincent de Paul. Martyred in the French Revolution. Benedictine abbot. He and 84 of his brother monks were martyred by invading pagan Danes. Brother of Saint Petronius of Die. Bishop of Die, France. Much persecuted by Arians. Bishop in Mesopotamia. Martyred in the persecution of Shapur II. Mentioned in the Gorman Martyrology. Sixth century abbot of a monastery in the Orkney Islands, Scotland. A group of Benedictine monks martyred by pagan Danes - Agamund, Askega, Egdred, Elfgete, Grimkeld, Sabinus, Swethin, Theodore and Ulric. Group of Christians martyred in Masyla in northwest Africa. Seven virgin-martyrs in Sirmium, Pannonia (modern Sremska Mitrovica, Serbia). A group of Hermits, hermitesses, and monks who lived in or around Thorney Abbey who were martyred together during raids by pagan Danes. We know little more than the names of three - Tancred, Torthred and Tova.